There are many weather stations to choose form, and it is easy to get lost in all the models and types. In the end you don’t know which one is right for, most reliable or give more value for your money. That’s why we decided to put this short review on one of the top picks in the home weather station class – the Vantage Pro2. Davis Instruments AWSs are the market leader in their category, which is targeted toward the high end systems within budget reach of most amateur meteorologists. Davis seems to have taken a different route with their weather stations creating more rugged devices that are designed to offer years of service. As with most stations in this class the Vantage Pro2 includes an integrated sensor suite (ISS), console receiver and mounting hardware. The VP2 display console is the unit that you place inside your house and provide you with information on current weather conditions on its large LCD display. The console is the receiver and processor of outside data and her main funtions is to with is to outut and record your station’s weather data, provide graph and alarm functions, and interface to a computer using optional WeatherLink software. You can manipulate the console by using the keyboard buttons. You can view current and historical data, set and clear alarms, change station models, enter calibration numbers, set up and view graphs, select sensors, and read the forecast. The console updates the data every 2.5 seconds. Buttons are well-labeled so you don’t have to see the Owner’s Manual to read how to change from monthly rain total to yearly rain total. The console will show the following – wind direction, wind speed, amount of humidity (inside /outside), the temperature (inside/outside) and barometric pressure. Also instead of using barometric pressure you can switch to millibars. Graph data is available for all the main data sensors, although it’s a bit small and not very visible. The display has a convenient backlight function available through a button. In addition to all these tracked variables you can keep a track of extreme highs and lows like wind gusts and temperature with information about the time of the day that they occurred. The Integrated Sensor Suite (ISS) monitors the outside weather conditions and sends the data to a Vantage Pro2 console trough a wireless and cabled connection. The ISS with wireless connection is solar powered and sends data to the console via a low-power radio. It is important to know that sensor suite can transmit to any number of indoor units, so you can add additional consoles to use in different sections of your home. The ISS consists of a rain collector, temperature measurement sensor, humidity sensor and anemometer. In addition to all this features, the ISS Plus adds a solar radiation sensor and an UV radiation sensor. To minimize the impact of a solar radiation the shield is used to contain the temperature and humidity sensors. 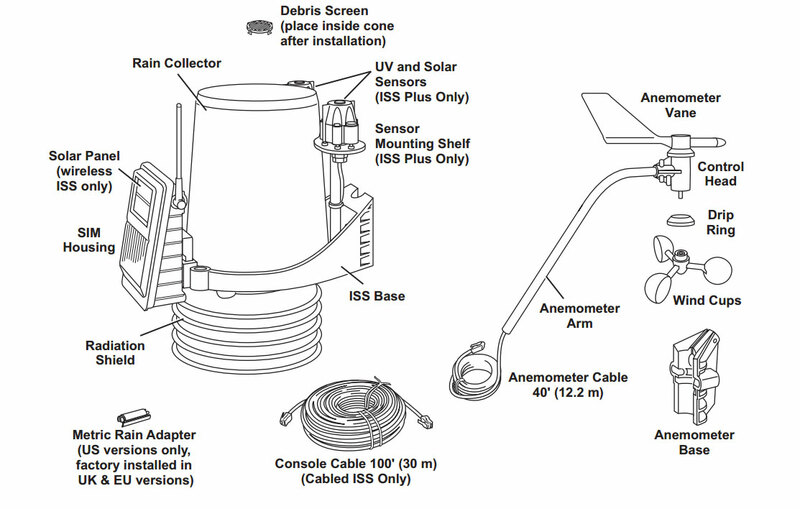 The anemometer (wind speed sensor) can be installed adjacent to the ISS or apart from it. Overall the sensor array is compact, accurate, solar-powered with extremely low maintenance. Wind (Anemometer) – Accurate. Works well in strong gusts and in severe thunderstorms. Maximum anemometer wind speed 170 mph. You can always check the data obtained by the data logger to see how hard it blew in an overnight squall. Rain Collector – The most fascinating sensor to watch. The same type as many professionals use. Can measure rain accumulation and rain rate. Comes with different measurement magnets for US (0.01”) and EU (0.2 mm) versions. Humidity – Housed inside the radiation shield the humidity sensor gives reliable and accurate data. Provides accurate weather data in a sophisticated yet easy-to-read format. 5-inch by 6-inch LCD screen. Wireless transmission reducing the cable usage in your home or office. Can retransmit data from one Vantage Pro2 console to another. Additional weather information includes barometric pressure trend, heat index, dew point, time of sunrise and sunset, moon phase, forecasting icons and much more. Solar energy power with backup battery (1 to 2 years life span). Wireless transmission range 1,000 feet (line-of-sight) with typical range from 200 to 400 feet. 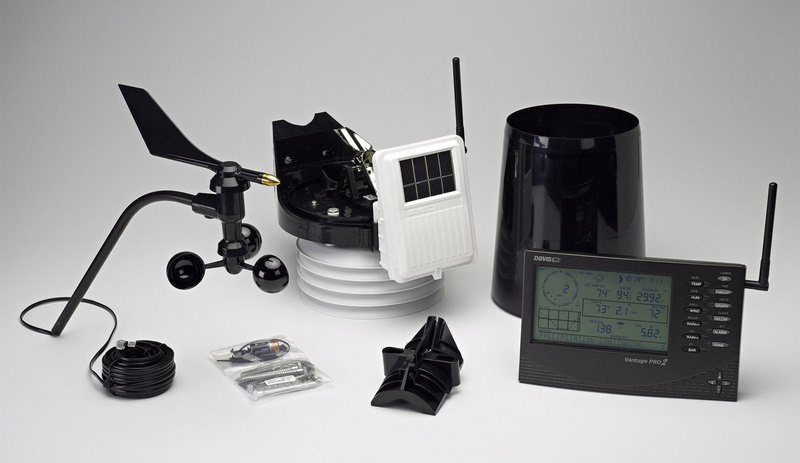 Expandable weather station compatible with up to eight different sensors. Console powered by AC adapter with 3 “C” backup batteries (not included). Batteries last up to one year under normal use. Data logger and software package available, sold seperately. The Installation is easy and takes just under an hour can be carried by almost anyone with basic tools. All the necessary supplies like U clamps for a 45mm Ø pole and coach screws for a post or wall are included in the box. Davis Instruments has put a lot of thought and a lot of technology into their weather stations. That’s one of the reasons the Pro2 requires very little maintenance and regular recalibration. If you want a reliable weather station with a lot of installation flexibility, it is worth the extra money. We think the Pro2 can be one of those gadgets you come to realize you need till you have one and then can’t live without.